Bathroom is the only room in our house where we are encouraged to stay a long period of time. You can use this place to relax after a long day. The best thing about this place is that you can make the most of your heaven by giving it a proper lighting. Some experts give advice on how to proper install lights and use them in your bathroom in order to make an incredible experience. Here is their advice. This is the light with which you can best see yourself with. You should pay attention to where the lighting is placed says one expert. The expert recommends to use a pair of sconces mounted at eye level to provide with shadowless illumination. If you do your makeup in front of the mirror in the bathroom this is the best scenario for you. This trick will also be great for tooth care and shaving. If you add the light above the mirror there will be a lot of light onto your forehead and shadows will be casted below your eyes, nose and even chin. This light isn`t effective for shaving or for applying makeup and it can even age you by 10 years. When people look at their reflection they should look at their best. If your light is proper in the bathroom, you will feel more confident throughout the day. You can put the task lighting on a dimmer in order for your eyes to adjust in the morning. If you have art in your bathroom, you will manage to show it off with accent lighting. Recessed directional lights will provide some focused illumination. This type of lighting will provide your bathroom with a visual sparkle. 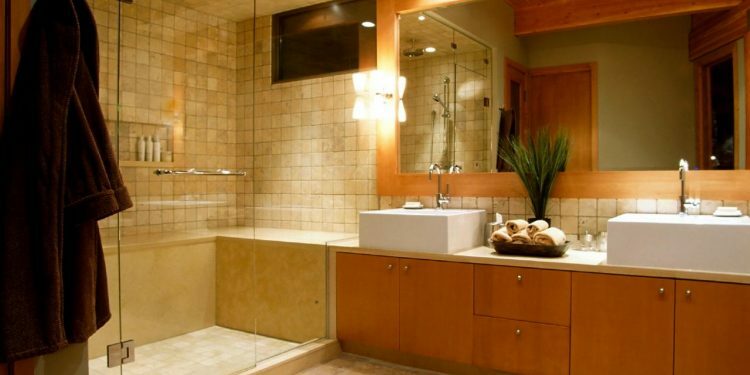 You can take advantage of single pendant in a square-shaped bathroom. You can use this light as a fill one. If you have taller ceilings this light is better for you. Ambient lighting fixtures can easily be installed along the perimeter of the space. If you take advantage of these lights you will see that the possibilities will be endless. You will be able to create a distinctive indirect lighting. Tip: Choose a pendant fixture. This pendant will be the source of both decorative and ambient light that will make the bathroom pleasant. You will see that it will be a bit hard at first when you start adding lights to your bathroom. As you proceed in doing so, the result will be significant. For an interesting experience you can install colored shower lightings. These showers will work great along with the ambient light and the experience will be improved. Put the fan and lighting on different switches. Putting each light source on different switches allows you to choose what you want to lit and when.